I have just been looking at the equipment section of Steve Cannistra’s web site. This section has proven so useful to me over the years (thank you very much Steve!!) that I thought I would give a “running commentary” on putting together some of the “finer detail” stuff needed for the mini-WASP array. I have been flitting around with the final configuration for the array, but as I have a True Technology slimline filter in the bottom drawer it makes sense to test out one of the ideas with the Sky 90 still piggy-backed on the C11 – and that is connecting a Sky 90 and one-shot colour camera to a filter-wheel. I have taken narrowband images with the one-shot M25C and they added valuable data and contrast to the standard one-shot colour image. Images where narrowband data greatly enhanced the RGB image include the Rosette nebula (OIII added), the Jellyfish nebula (H-alpha and SII added), M31 (H-alpha added), and the Veil nebula (H-alpha and OIII added). 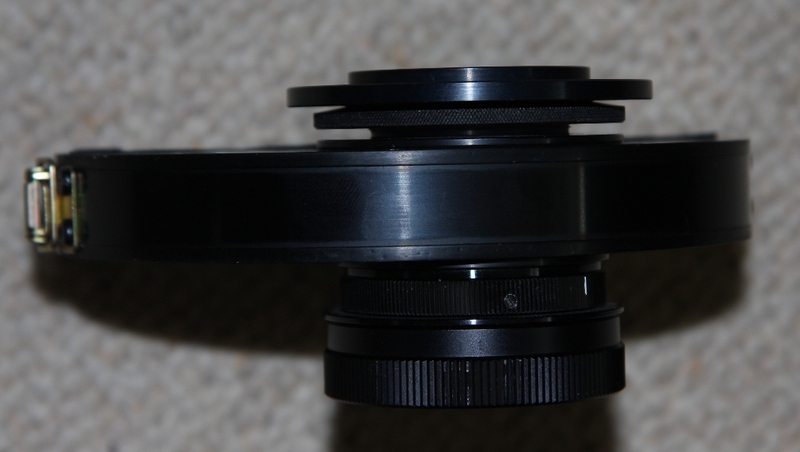 Below is the True Technology slimline filter wheel with fiitings to go to the f#4.5 reducer/corrector on the back of the Sky 90 and to the M25c/M26c one-shot colour camera. There is just one niggle with this setup (there’s always at least one niggle isn’t there!) The M25c/M26c cameras have the collimation screws on the front face of the camera facing the filter-wheel face plate! Now the bigger H35/H36 mono cameras have the collimation screws BEHIND the CCD faceplate, so they are on the camera side of the CCD so you can get at them easily. Not so the M25c/M26c – why not – I have absolutely no idea, but Terry it isn’t a good place to put the collimation screws on the front face of the camera 🙂 There is just about enough of a gap however for me to get at the screws if I can cut down a couple of Allen keys to allow me to do the job – or it might be filing them down, I know how very tough Allen keys are! So next part of the process will be to fit the filter-wheel to the Sky 90 (when the Allen keys have been sorted) and go for some RGB/narrowband data, almost certainly I will make a long-awaited return to the CTB1 supernova remnant in Cassiopeia, this object is NOT going to beat me. Keep visiting NFO for the latest mini-WASP developments. Custom modified Allen keys are best made with a cutting disc on a dremel tool. Or an angle grinder for the large ones!